Wendy’s, the third largest burger fast food chain in the world, has been around since 1969. Created by Dave Thomas, and named for his daughter, Melinda (Wendy), it was a brand that was folky and wholesome. By the 1990s, Dave had become a household name, as he had appeared in more than 800 commercials, and a survey conducted by Wendy’s in the 1990s showed that 90% of Americans knew who he was. By using enhanced technology and digital marketing, they have evolved their brand voice to show a more snarky side, which has really resonated with customers. They’ve even released a mixtape, “We Beefin”. 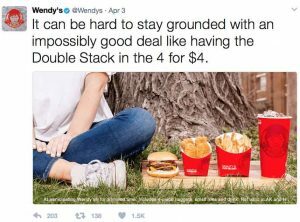 Here are 4 examples of times Wendy’s has stepped up their social media presence to engage and attract customers. 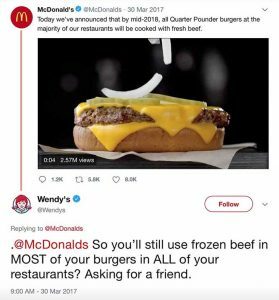 Wendy’s manages to be self-promoting and fun. Their brand voice is clever, casual and funny, and sets them apart from the competition. This isn’t their first, or last, jab at McDonalds. In their 2018 Super Bowl ad “Iceberg”, they used copy from McDonald’s website against them (“our beef is flash frozen to seal in fresh flavor”) and urged consumers to “skip the hamburgers at the Frozen Arches”. Due to the internet, customers today are used to constant and instant accessibility, and Wendy’s is extremely responsive. 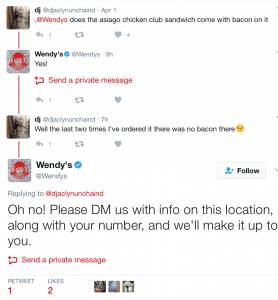 Wendy’s responds quickly, and seriously, to customers who have complaints, and will even apologize for the delay if it takes them a while to respond. Carter Wilkerson, a Nevada teen, became a Twitter sensation in 2017 when he went asked Wendy’s a simple question. 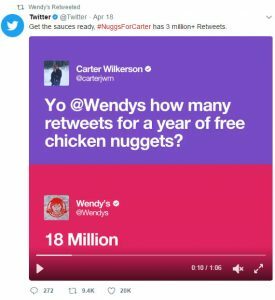 Wendy’s response set him on a mission, and his campaign hashtag #NuggsForCarter went viral. While he didn’t get 18 million retweets, he did get more than 3.6 million, the record for a single tweet. Wendy’s lifted the 18 million goal and gave him the nuggets anyway. Wendy’s got national exposure, for the price of a year of free nuggets. Wendy’s posts frequently, and maintain the same voice throughout their postings. Consistency is key on social media, both in terms of what you’re posting and how often. Even when they are posting different types of content, their voice is consistent, and in line with the brand as a whole. The long-term consistency allows them to keep their audience engaged, and the momentum going.